Tiger sharks are among the most dangerous of sharks, known for their unprovoked attacks throughout the world. They are the leading attack species around the Hawaiian Islands. 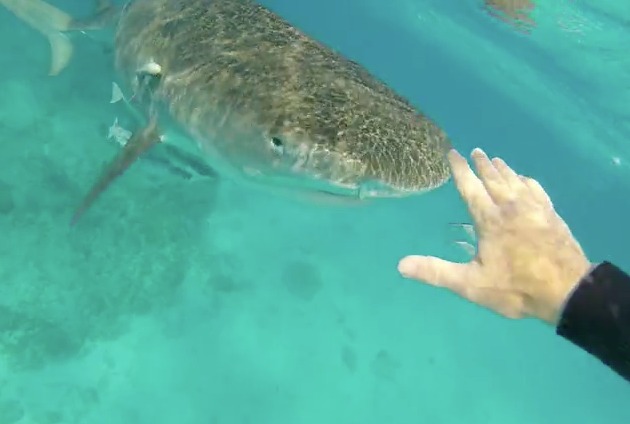 So when you’re swimming with tiger sharks, you do so at your own risk, as noted big-wave surfer Mark Healey has done quite a few times. So many times, in fact, he’s known as the Shark Whisperer. His latest encounter shows a tiger shark coming dangerously close, promptly Healey to reach out and brazenly push the tiger shark away. We presume this is filmed off the waters of Hawaii since he is a North Shore waterman. Mark Healey might be the Shark Whisperer, but if he’s not careful, one of these days he’ll become Shark Bait.